TEL AVIV, Israel (CNS) — For foreign workers and other nonlocal Christians living in Israel, celebrating Christmas far from loved ones in a country where Christians are a minority can be a difficult time. “We are missing our families. We are used to seeing all the Christmas decorations everywhere,” said Vangie Lapada, 51, who has been working in Israel for five years. She is a caretaker in the Golan Heights in northern Israel, where there are few Christians. But as Israel’s population has become more diverse to include foreign caretakers, migrant workers and asylum seekers — many of whom are Christians living in cities where Jewish residents are the majority — Jewish Israelis also have adjusted to a new reality. One of the changing points has also been the arrival of Jewish immigrants from the former Soviet Union where the New Year celebration, Novy God, uses many of the usual Christmas symbols for the nonreligious holiday. Novy God was the only nonpolitical holiday permitted by the communist regime in the former Soviet Union, which incorporated some customary Christmas symbols — such as the tree — into the celebration to placate people. The communist government also added parallel symbols from traditional folktales such as the Snow Maiden and Grandfather Winter. All religious celebrations were forbidden under the communist regime. “This (market) makes me happy because it brings a bit of our tradition,” said Lapada as she and Angeline Fernando, 48, snapped selfies of themselves wearing Santa hats in front of a white plastic Christmas tree covered with decorations. English Christmas songs played from a stereo, adding to the atmosphere. “My employer is a religious Jew, so we don’t have a tree in the apartment. I come here to take pictures and feel the spirit of Christmas. These decorations are part of Christmas for us,” said Lapada. “Every day we have visitors, and they all say how beautiful the decorations are because of the colors. But I come here to see the trees, and I feel like I am in the Philippines,” Fernando said. “My mother wanted to buy the special glass decorations they have here instead of the plastic ornaments sold in Jerusalem,” said Rami, a Palestinian Christian from Jerusalem who declined to give his last name. His mother went from one stall to another, looking over delicate, hand-decorated ornaments nestled in boxes; larger ornaments made to look like snowflakes; and china Santa Claus/Grandfather Winter dolls. 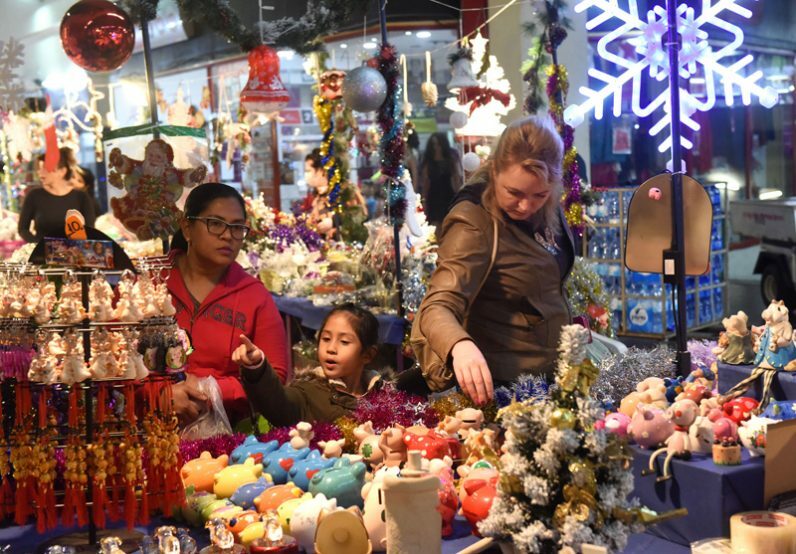 “It is very hard and sad to celebrate Christmas without my family, so I am very happy to see this market, because I didn’t know where I was going to get my decorations from,” Giraldo said. She heard about the market through a Facebook page, she said.